More than 800,000 ceramic poppies are being “planted” in the moat of the Tower of London to commemorate the centenary of World War I. The work of ceramic artist Paul Cummins, Blood Swept Lands and Seas of Red will grow throughout the summer until, by Armistice Day, 888,246 ceramic poppies are ‘planted’ in the dry moat, each one representing a British or colonial military fatality during the war. 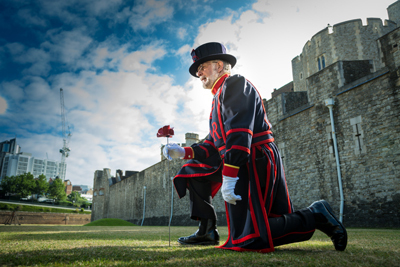 The first poppy was planted by Yeoman Warder Crawford Butler back in July (pictured) and the work was officially “unveiled” today – 100 years since the first full day of Britain’s involvement in the war. More than 8,000 volunteers will be involved in planting the poppies which can be purchased for £25 with 10 per cent from each poppy plus all net proceeds shared equally among six service charities: the Confederation of Service Charities (COBSEO), Combat Stress, Coming Home, Help for Heroes, Royal British Legion and SSAFA (formerly the Soldiers, Sailors, Airmen and Families Association). Starting today, the public will also be able to witness the daily twilight reading of a roll of honour featuring the names of 180 serving military killed during the World War I from Tower Hill terrace. The reading will be followed by the bugler playing the Last Post. Members of the public can nominate a name for the roll of honour.